It's Election Day--but we're not going to talk about the election this week. By the time you read this, you probably have voted already, so what's left to say? If by chance you're waiting in line to vote or haven't left home to do so yet, and you're looking for some guidance, please go to the sidebar and hit the "Home" link and scroll down and read numerous pieces written by progressive thinkers over the past year. We've shared our thoughts with you, but now you're on your own. Good luck and remember to always vote your conscience. Don't let the bullies tell you you're "wasting your vote." Think, perhaps it's the bullies who have wasted theirs by voting for a fellow bully? This week we're concentrating on what sort of America we'll have in spite of the person who sits in the Oval Office. We're looking at who is truly calling the shots in our government. Surprise! It's not the president, it's not the Congress, and it's not the Supreme Court, either. 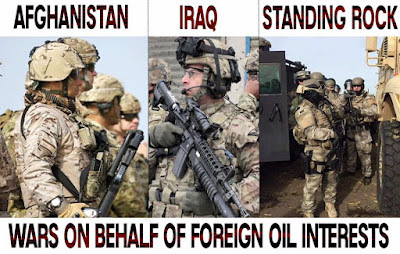 As a very insightful meme says: "America is an oil company with an army." Our corporate masters of the one-percent are our true leaders, and they've decreed that drilling or fracking for oil and gas is the most important thing in the world. It's even more important than the lives of the people they wish to sell their products to, which makes no sense really since once we've gone extinct... Theirs is truly a warped philosophy. Big Oil must make trillions in profits at the expense of the planet and its climate, at the expense of the people's health and safety, and at the expense of the peace of the nations. Once you've come to accept this as your Gospel, nothing else matters. 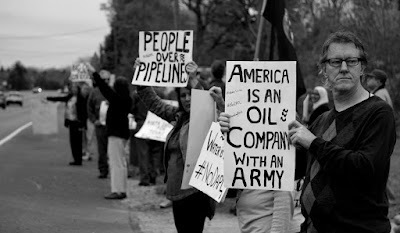 Not all accept this "religion of oil," however. 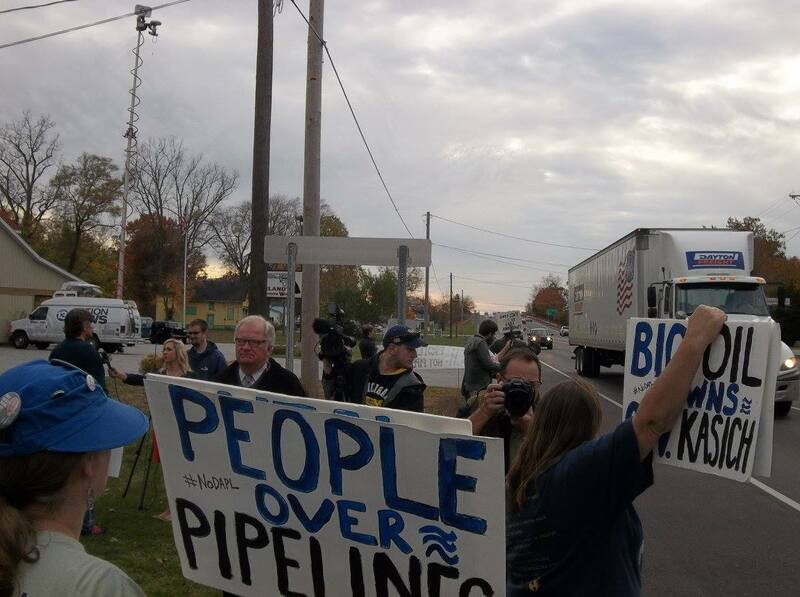 A group of fifty Ohioans braved the rush hour traffic and the car exhaust and took a stand against Big Oil's twisted logic recently. 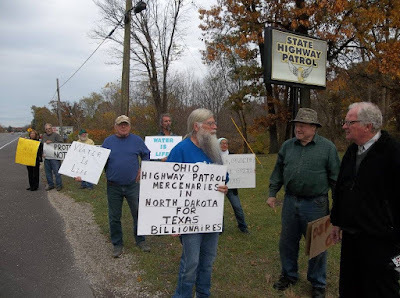 They stood on a busy highway in front of an Ohio State Highway Patrol office near Toledo Express Airport, carrying signs indicating their displeasure with Ohio Governor John Kasich (a former Republican presidential candidate) and his decision to send 37 Ohio state troopers to North Dakota to terrorize the peaceful water protectors at the Standing Rock Sioux Reservation. The protestors didn't know how their message would be received by the general public, but they boldly stood up for the civil rights of their fellow Americans anyway. In the end, they were rewarded with quite a few honks of agreement and thumbs up. Plenty of reporters showed up and taped interviews and snapped photos. Even the local troopers were polite and accommodating of the protest. Not everyone has drunk the Kool-Aid of Big Oil it seems after all. 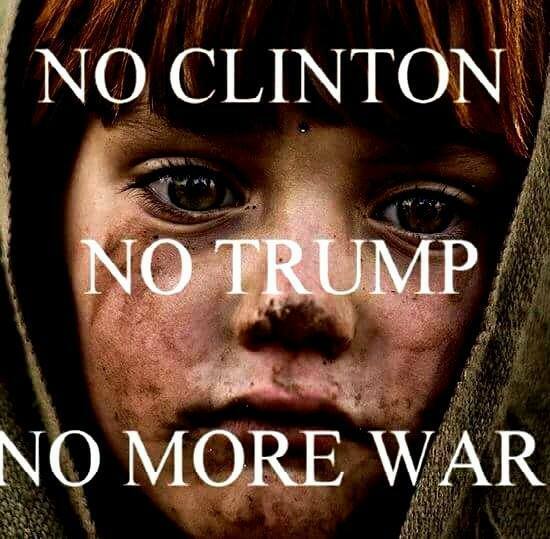 Our Revolution is in its early days still, but now isn't the time to hesitate. Now is the time to start making those signs and marching in those parades and chanting slogans to passers-by. Now is the time to win the hearts and souls of our fellow citizens, to shout at them to stay awake and remain vigilant. 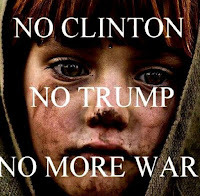 Now is not the time to simply turn over and go back to sleep and allow the oligarchs to continue their stranglehold on hurting peoples everywhere and our planet's very existence. Forget the election and the villains it gave rise to. They're worth forgetting. But never forget what our purpose in life truly is--it's to take care of each other. 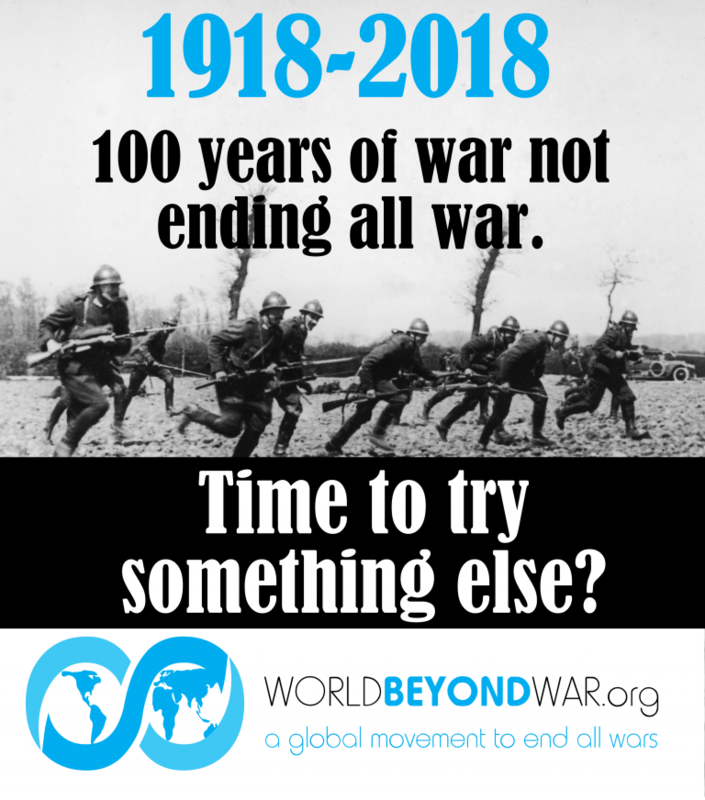 Get out there and take action to make the world a better place for all. To quote Jill Stein: "It's in our hands." 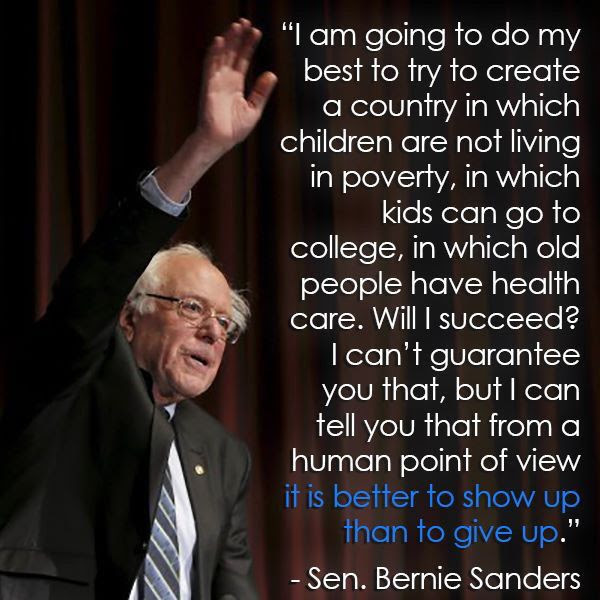 To paraphrase Bernie Sanders: "Let's make it a future to believe in." There are many ways to help the water protectors at Standing Rock. The video below gives you some ideas, and the next story provides contact information for you to let those responsible for this travesty know how you feel. 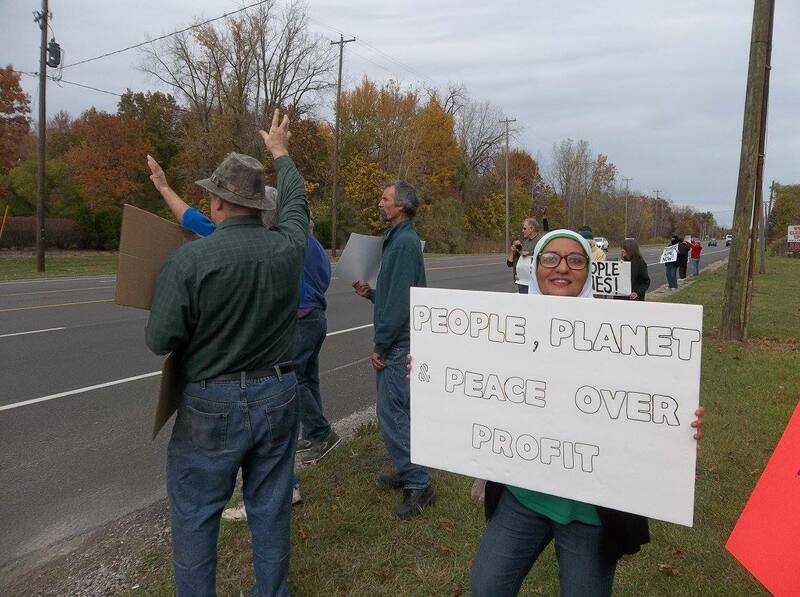 A crowd of about 80 turned out on a sunny autumn afternoon in the college town of Bowling Green, Ohio, to send prayers and well-wishes to the people of Standing Rock. Native Americans, college professors, environmentalists, students, and an environmental lawyer and a city council member shared their thoughts about what is happening on the reservation. They gave insights, history, science and legal information we can act upon to close down the Dakota Access pipeline and others like it, such as Ohio's Nexus pipeline (planned to cross under the Maumee River), once and for all. The irony of the DAPL is that its original route was to go north of the Standing Rock Sioux Reservation, but the residents of the capital city of Bismarck didn't want it routed their way. It was seen as "unsafe," and so an alternate route near the reservation was chosen instead. History repeats itself as rich whites in Bismarck avoid the threat to their water supply, and they put their poorer Native American neighbors' water supply at risk. To date this year, North Dakota alone has experienced 273 uncontained oil spills and 908 contained spills, demonstrating the water protectors' very real fear of contamination of the Missouri River by a possible pipeline accident. More than 250 tribes have traveled to the camps at Standing Rock to show their solidarity with the Sioux nation. UN monitors and the ACLU have also traveled there to watch and note any excessive use of law enforcement against the activists, including the use of pepper spray, water cannons, rubber bullets and attack dogs. 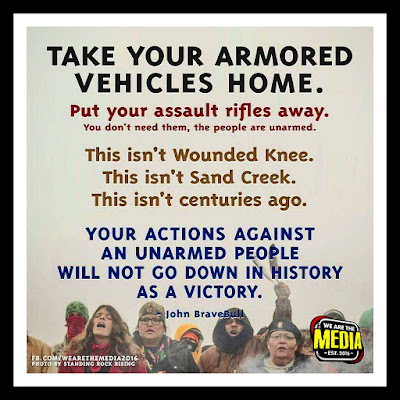 Everyone is encouraged to keep sharing Standing Rock information and news on all social media platforms, since the mainstream media is ignoring what is happening to the water protectors. 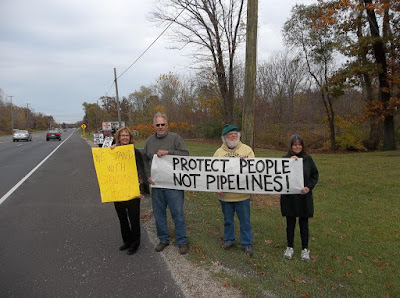 Contacting our government officials, the Army Corps of Engineers, and the pipeline builders, Energy Transfer Partners, is also encouraged. Let your voice be heard! Please contact the politicians and business leaders listed below and let them know how you feel about the treatment of the water protectors at the Dakota Access Pipeline. 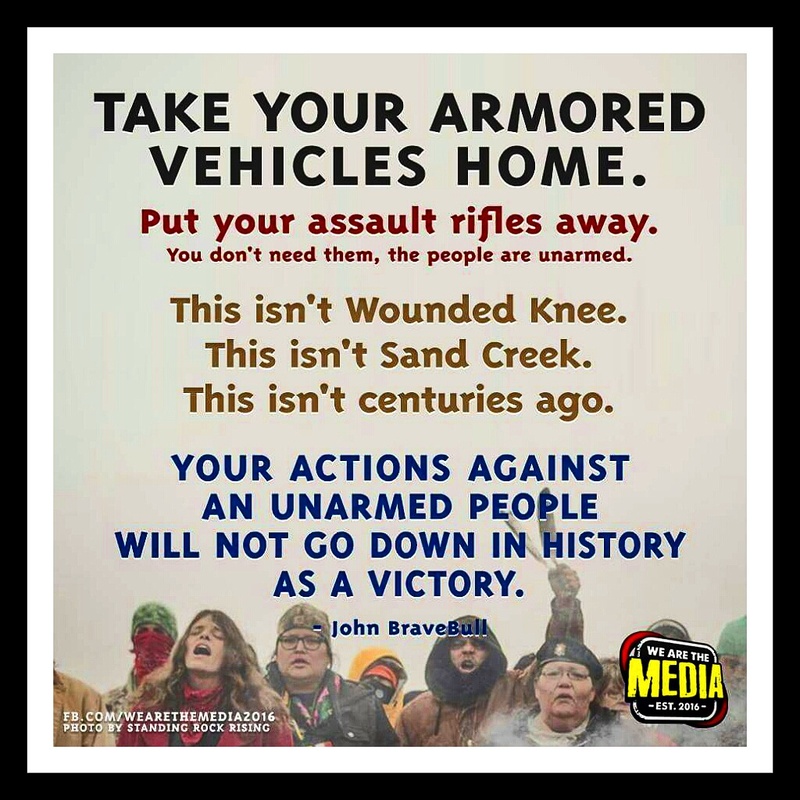 Governor John Kasich (Ohio): 614-466-3555 and request the 37 Ohio State Troopers sent to Standing Rock be brought home immediately. The White House: 202-456-1111 or 202-456-1414. Tell President Obama to rescind the Army Corps of Engineers' Permit for the DAPL. Sign up to go to Standing Rock--they need you there! Mni Wiconi! 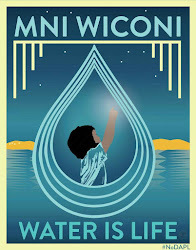 Water IS life and it IS sacred, no matter what the oligarchs say. You can't drink oil! Actually in the picture of the soldiers, none of those are American soldiers. And yes, oil is important we do in fact need oil for basic things. Yes, we do get oil from those countries, and yes there are terror groups like ISIS in those countries with lots of oil. Hence the fighting.